With the new check in luggage charges we are all trying to pack smarter and bring less, preferably as a carry on. 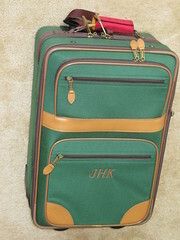 The first Carry on wheeled luggage was used by the flight crew long before it became the norm, and this style has now come to dominate the type of carry-on luggage most people use. The good news is that the new carry ons can hold more stuff. The Airlines and the tsa have set rules for what one can and can’t carry on an airplane. You are now allowed to carry on 1 personal item and 1 small piece of (carry on) luggage. On top of that tsa has created the 3-1-1 rule for carrying on liquids and gels (see below). For most airlines, the maximum size is a total of 45 inches (for the most part, 22 x 14 x 9 is the standard for 45 inches). Just add the height, width and depth. These are standard sets of dimensions that go to make up these totals and if you have a bag that is an unusual shape but still within the total number of inches, you may find it being rejected. I would stick with a width of no more than 14 inches, this will get you down the aisle of most planes and a depth of no more than 10 inches will get you into the over heads. Airtrans requires a total of 55 inches, but they don’t tell you need a depth of no more than 10 inches or you may not get your luggage in the overheard and certainly not under the seat. Simply: 1 person can bring a 1 quart bag with containers no larger than 3.4 ounces. It’s best to keep the quart bag in an easy to reach part of your bag like the top outside zippered compartment for easy access in case the tsa are on the alert and need to make a visual inspection. Is Your Carry-On Bag Legal? Most luggage stores and manufacturers seldom tell you if their bag is legally sized or not, but they also frequently mis-measure their bag. Their measurements generally are for the inside of the main compartment, and don’t take into account stuffing the outside pockets full (which can easily add another inch or so) and may ignore any external framing like wheels and carry handle.